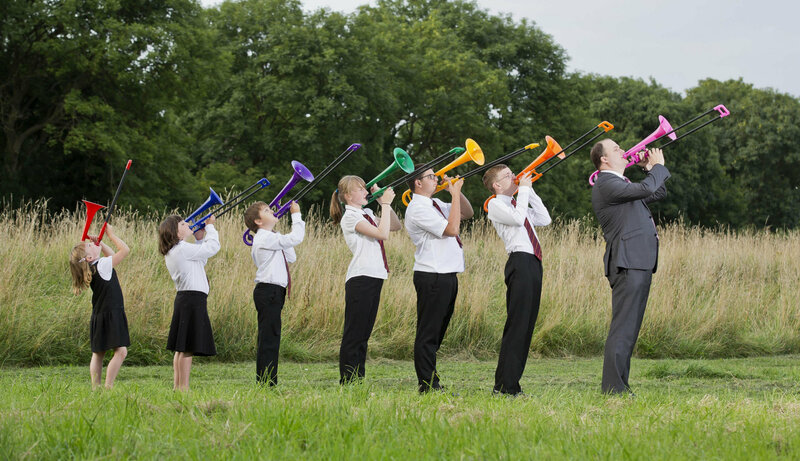 Members of Ratby Junior Band were delighted to be asked to be involved in the promotion of an award winning product and ground breaking innovation – the pBone. The plastic trombone, ideal for players young and old, novice to the more professional was the innovative idea of former Ratby Band chairman Steve Greenall. As part of the celebration of Steve winning the Innovation of the Year award in the Nectar Business Small Business Awards 2013, the members of our Junior section showed Steve (a trombone player himself) how it should be done. All at Ratby were very proud of our youngsters in the national press, and of course proud of Steve and his great success! Well done Steve. Look out for any colourful pBones on a concert stage near you!